The first generation Moto E helped to redefine what a value handset from a big-name manufacturer should look like. Less than a year later, Motorola do it again with the Motorola Moto E (Second Generation). Perhaps predictably, the second generation of the Moto E is bigger, faster and altogether better than the original one, but it is a little more expensive too. Retailing at $149.99, £109.00 or around €139.00 depending on market, the second generation device is roughly 20% more expensive. But is it worth the increase in the sticker price? This version of the Moto E now supports LTE where the old version did not. The display is the same resolution (540 x 960 pixels) but the screen is now a 4.5" panel. Inside is a 1.2GHz quad-core CPU which should give a useful (but not huge) speed boost over the dual-core CPU in the old one. There's still just 1GB of RAM in the Moto E, but onboard flash memory has been doubled to 8GB (plus a microSD slot). 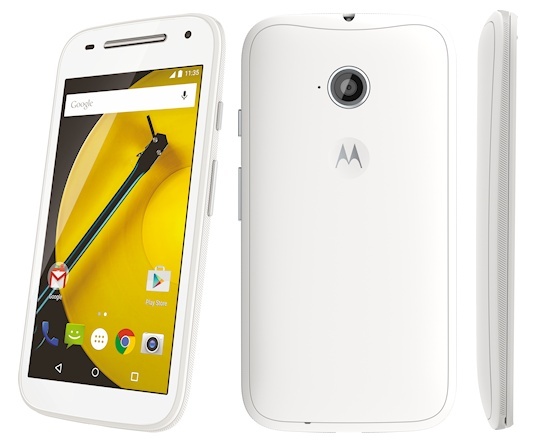 The new Moto E adds a front-facing 0.3 megapixel camera while retaining a similar 5 megapixel one on the back. It is capable of 720p video capture at 30fps. Inside is a big 2390 mAh battery, 20% bigger than before. The whole package is a little bigger and heavier than before, although the larger screen will account for most of this. 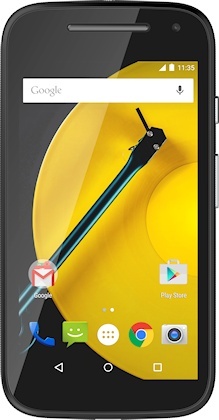 This is an Android 5.0 "Lollipop" device, which is a pretty rare thing for a budget smartphone to have. You can also easily personalise your Moto E with a wide variety of coloured bands and grip shells to go with the basic black or white handset. There's no doubt that the second generation Motorola Moto E offers a lot of handset for the money. Yes, there are a lot of Android handsets with much better specification out there, but even the bargain OnePlus One costs more than twice as much. Motorola will find some tough competition from Microsoft's Lumia range though which now come with the much-improved Windows 8.1. The Motorola Moto E (Second Generation) is available to buy now in many regions, and for the time being the original non-LTE Moto E is still available if you are after something cheaper. And because the original Moto E was a very strong seller for Motorola, we expect that the second generation will be too.